The 7.8 magnitude earthquake on 25th April 2015 had life changing consequences for almost everybody living in Nepal, one of the poorest countries in the world. Thousands were killed and millions of people across Nepal were left homeless. 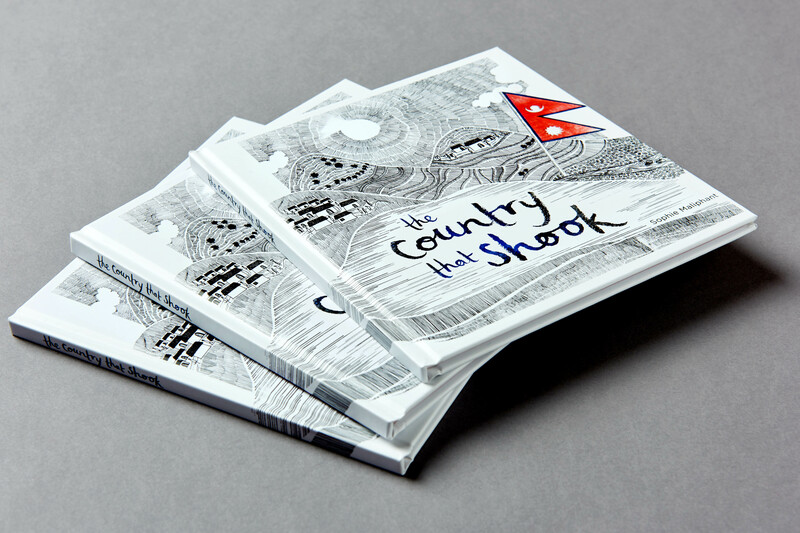 The Country That Shook is raising money to support people who are literally rebuilding their lives following the natural disaster. It has been created by Sophie Maliphant, a graphic designer who experienced the quake first hand. 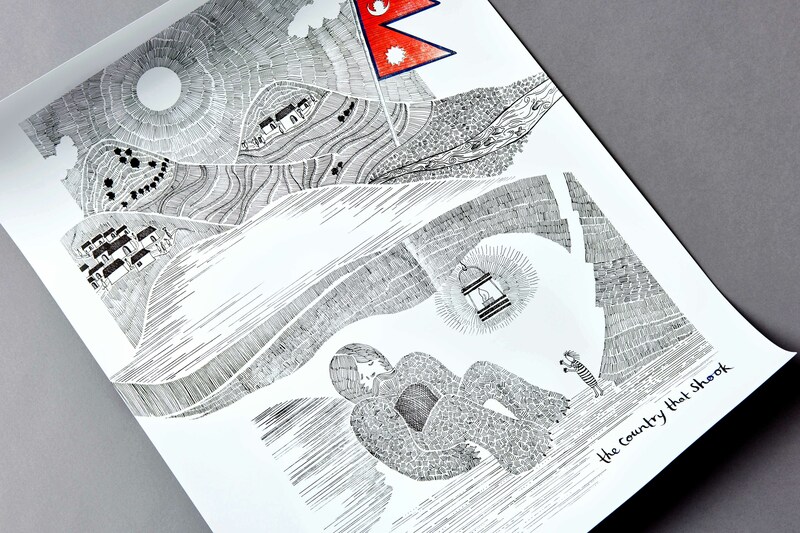 At the heart of the project is a children’s book, which has a rhyming narrative and beautiful hand-drawn illustrations. It is the story of a young girl, caught up in the catastrophe, who discovers the surprising cause of the quake and has to bravely stand up for her country to stop the shaking. There is also an A2 print, inspired by the story. And a screen-printed T-shirt. All of the products are available to buy in the online shop. 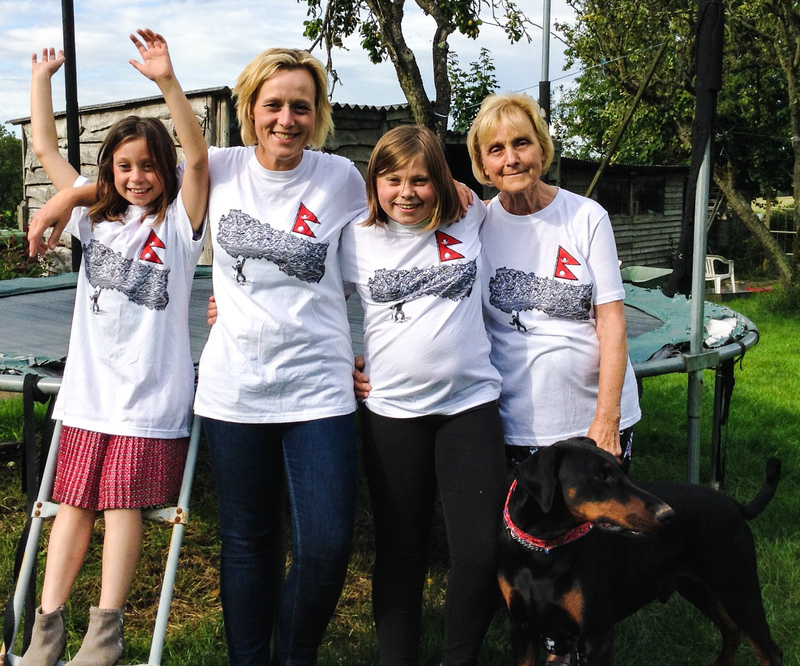 A Kickstarter campaign in 2015 ensured that the production of all our merchandise is funded so now every single penny that you spend will go to Nepal (excluding P&P of course). In June 2016, The Country That Shook partnered with The Gurkha Welfare Trust (registered charity number: 1103669) to support Shree Barbot Lower Secondary School. The school teaches 199 children from nursery through to year 8. It was badly damaged in the earthquake. Four classrooms, a toilet block and a clean water supply will be reconstructed. The Country That Shook was able to donate enough money to fund the building of two classrooms, and the toilet block which is incredible. All supplies arrived at the construction site using donkeys and mules as it’s impossible to get a vehicle close to the school! In May 2017 the construction was finished, before the monsoon rains began, and the children were able to start using their new school. In April 2018, almost exactly three years since the earthquake, Sophie was able to return to Nepal, visit the finished school and attend the opening ceremony! We’d love to hear from you and for you to support us in any way that you can. P.S. Check out this video to explain the project. No problem at all, please visit http://www.psgoneexploring.com/shop to order our products. Susan, thanks for sharing your lovely story and supporting our project with your purchase! We are so grateful! This looks wonderful. I am returning to Nepal in November to teach at Segyu Monastery in Kathmandu. Many of the mini monks there now are from this village due to the conditions, and actually the monastery was able to bring some roofing metal to the village last year. I purchased one book to bring with me to use in the new classes. Unfortunately not in the position to get more as we also reply on donations for everything, but I think it will be helpful to utilize this story in classes. I wish you great success with your good works. Thank you Abby for your kind words and support! That’s incredible that you are going to take your copy back to Nepal. How long will you be teaching in the monastery?